La Cova is a Spanish tapas bar located across the river; it is an easy to reach location. The clientele of the restaurant is mixed between students, adults, families, teenagers, etc. It has a very welcoming environment. As soon as we walked in we heard Spanish music playing in the background which added to the authentic vibe of the establishment. Though the waiter knew little English, he was very helpful and answered our questions about the food to the best of his ability; one of our group members is gluten free, and he was able to suggest tapas that she could eat. Additionally, when we asked him for a typical Spanish drink, he suggested the Sangria, which was fruity and refreshing. He explained the process of ordering tapas, and our meals came out staggered, which allowed us to share a lot of food. The menu is a tapas menu filled with a variety of choices between meats, vegetables, seafood, bread and fried food. The drink menu includes wine, beer and cocktails. Overall, the meals were hot and fresh. The sauces that came with tapas, such as the calamari and patatas bravas, were flavorful but not overpowering. We only spent about 20 euros per person, so it was a very reasonable dining experience for the variety and amount of food we ate. 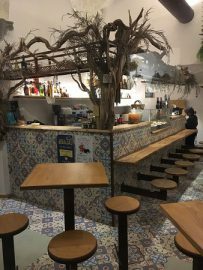 Though our experience at La Cova was surprisingly good, we do not suggest going in a large group, as the restaurant does not have enough space to hold large parties; most tables are made for 4-6 people even though the restaurant itself seats 80-90 people. Another suggestion is to order a bunch of different tapas and split them instead of ordering your own just for yourself. We would recommend this place to anyone of any age and background, because it is such a casual and cool tapas restaurant. This entry was posted on Friday, November 16th, 2018 at 9:28 am. It is filed under Florentine Foodie. You can follow any responses to this entry through the RSS 2.0 feed.